The peninsula west of Oristano is more than just a beach paradise. The scattered lagoons are a haven for over 150 species of birds, including cormorants, terns and red-crested pochard ducks. Another attraction on the shore is the archaeological excavation of an ancient city established by the Phoenicians in the 8th century BC and later inhabited by the Carthaginians in the 10th century AD. A path of dark basalt leads into the ancient past: a temple dedicated to the Greek goddess Demeter, a cultic sacrificial altar and a Roman necropolis. Boat trips can be taken to the offshore islands from the marina in Torre Grande. 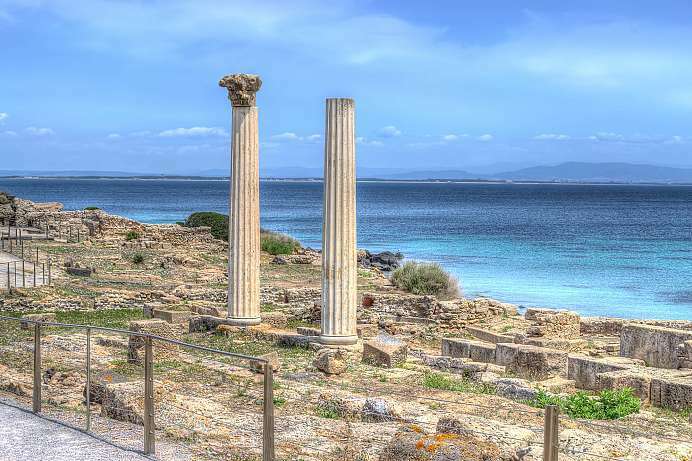 The ruins of the Phoenician and Carthaginian city of Tharros lie in the foothills running from the Sinis Peninsula southwards to the Cape of San Marco. From the 11th century BC until the eve of the Roman Empire, this city was a wealthy trading colony, seaport and stronghold. It was hastily abandoned in the 11th century AD after being pillaged several times by pirates. Ruins on a hill, bright sandy beaches and a magnificent view overlooking the gulf are what still remain today.